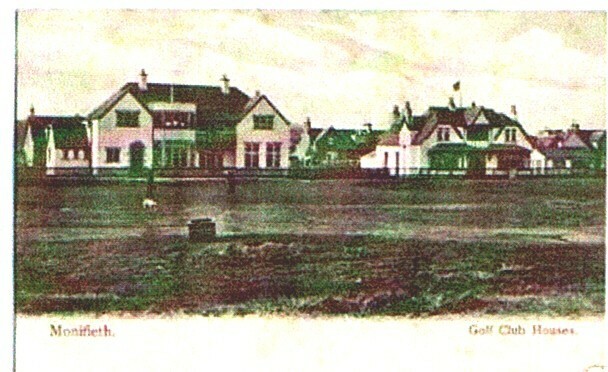 The golf course at Monifieth consisting of 117 acres, was acquired in 1899 at a cost of four thousand pounds, this sum being principally raised by means of a bazaar held in the Drill Hall, Dundee, on three concluding days in September of that year. 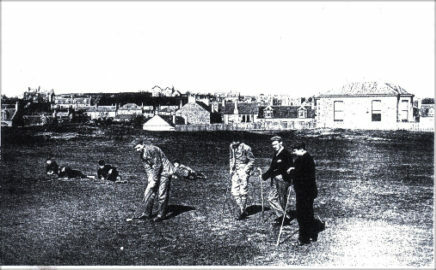 The links were used for the purpose of sport in very early times. 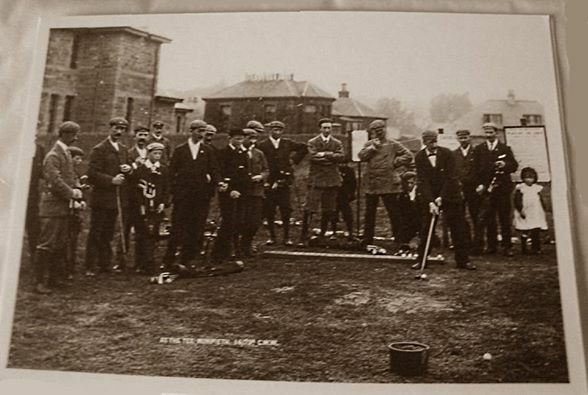 The caption I think reads ‘At the tee’ but after that it is a blur. Can anybody enlighten me as to the year? From Monifieth Almanacs by David McRae. Established 1858. Captain:- David Dempster, Secretary & Treasurer:- Andrew Walker, Foundry Terrace, Council:- James Burns, James Young, Alexander Johnstone, George Wright. Monifieth Challenge Cup played for in the months of April and May. Panmure and Average medals, on the first Saturday in March and September. Mudie & Gold Medal on the first Saturday of June & December. Fenton Gold medal on the second Saturday of July. Also six monthly competitions during the season. Secretary & Treasurer :- William Young, Young`s Cottages. Council:- Messrs David Dempster, Thomas Brimer, James Young and James C. Burns. Monifieth Challenge Cup, played for in the months of April and May. Panmure and Average Medals on the first Saturday in March and September. Mudie Gold Medal on the first Saturday of June and December. Far and sure driving medal on the second Saturday of June. Fenton Gold medal on the second Saturday of July. Also six monthly competitions during the season. Mr James Young submitted his annual budget to the management Board of the Monifieth Links on January 24th, which demonstrated that Monifieth as a summer resort is increasing in popularity. 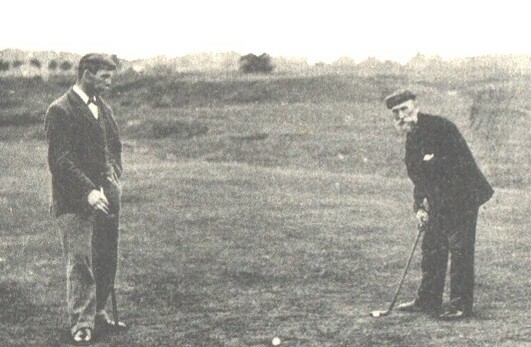 No better index to the growth of the burgh can be desired than the permits, which are issued for the daily, weekly and monthly visitors to the course. In numbers they have advanced materially, with the result that a handsome balance was at the disposal of the Council. Labour has not been spared on the course; the cry for bunkers has been fittingly answered. Still there is some surplus fund. An opportunity is presented for a reserve at the bankers. Why not invest the money in real estate? There is a piece of ground to the north of the Wilderness and immediately to the eastward of the Camps that would immensely benefit the present Links if the attachment were to be procured; not only so, the auxiliary course would be furnished by the annexation, and that congestion and two hours stand at the tee would be obviated if the additional course were secured. 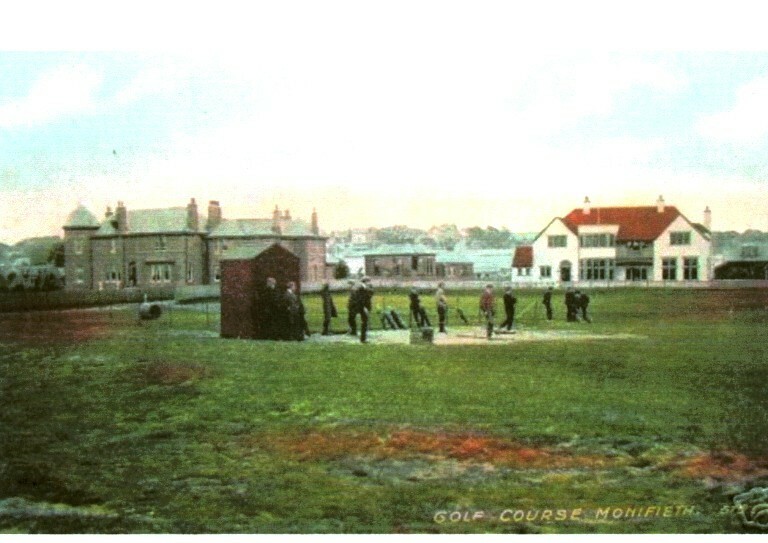 This entry was posted in Articles, Monifieth town and tagged Panmure, Young. Bookmark the permalink.